I have often been positive about Robert Venditti's Green Lantern, but Hal Jordan and the Green Lantern Corps Vol. 5: Twilight of the Guardians is a misstep. Leading in to two big storylines that will culminate with the end of the series and Venditti's run, Twilight marks time, with a couple stories that, while consequential, seem more padded than they need. The lack of this book's regular art team reinforces this placeholder sense. 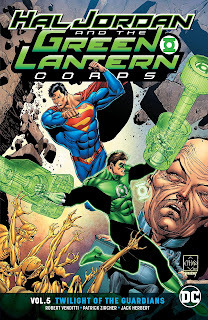 The arc of Geoff Johns' and Robert Venditti's "Green Lantern" runs swung from Hal Jordan as a disgraced Lantern and the Lantern Guardians slowly growing corrupt, to Hal as head among a Lantern-lead organization. But part and parcel of the Green Lantern mythos is the mysterious, erratic leadership of the Guardians, and the upshot of Twilight is to swing things back toward the middle -- to unite the "original" and Templar Guardians of recent runs and to install them again at the head of the Lanterns. This is quite fine, a good development by Venditti, and the classic Guardian tunics are a nice touch. The main "Twilight" story also teams the Corps' "big four" human Lanterns (the "Four Corpsmen," as Guy Gardner refers to them), and that's something we haven't seen overtly in a year or so, so that's also pleasant. It's nice to spotlight these characters, but going to some of Twilight's difficulties, Venditti does nothing particularly new or different with this teaming, teasing out no great insights nor distinctive character moments. I don't mind this title taking a smaller focus, but material with the former Sinestro Corpsmen-turned-Lanterns might have been more interesting than a run-of-the-mill Earth Lantern adventure. Indeed, "Twilight"'s main story is very paint-by-the-numbers. In the first issue, the heroes discover the problem; in the second, they find out where to go; in the third, they fight henchmen; in the fourth, they fight the main villains, the Controllers. Far more gripping are the scenes of Guardian Ganthet being tortured by the Controllers, with the distinct possibility that one of the favored Guardian characters might die; on the Lantern front, there's no nuance or complication to the story, nor any real concern built that the Lanterns might be in danger. All of this is ultimately prelude to what's really interesting, the Controllers' resurrection of the Darkstars; in large part Venditti could have just skipped to that without this "Controller origin" story, and that lack of real necessity is palpable. The Twilight book's extraneousness is underscored by the fact that the first two issues branch off a story from Superman Vol. 5: Hopes and Fears that was equally written by a guest team while Superman got out of the way of Action Comics: The Oz Effect. The bulk of each issue is a dream sequence, suggesting how these two issues might also have been shortened, and it's a minor annoyance that among the first thing Venditti has to do here is contradict the events that just took place in Superman. Be that as it may, it's fun to see Superman and Hal Jordan just chatting one on one (the last time being something like Adventures of Superman #473) and to see how they discuss Jon, for instance, so casually in the post-Superman Reborn era. Fantastically, as well, Venditti picks up a dropped storyline from early in Geoff Johns' Green Lantern run, bringing back the alien Krolotean masters of Hector Hammond. Art in the "Mind Games" story is by Patrick Zircher, offering nice continuity with the Super-titles, and his detailed, mature style is among the best in the book. "Twilight of the Guardians" apparently has pencils by Jack Herbert over breakdowns by Tom Derenick, but Derenick is still very apparent, especially in the very wide-mouth faces of the characters in dramatic sequences. Overall, "Twilight" looks to me a little too dark, too plain, and too distorted to attract a casual non-comics reader, as opposed to series regular Rafa Sandoval. The Green Lanterns now have a child among their members, something I don't think I totally understood at the end of Hal Jordan and the Green Lantern Corps Vol. 4: Fracture, and it's a charming sequence toward the beginning of Hal Jordan and the Green Lantern Corps Vol. 5: Twilight of the Guardians as the Guardians and John Stewart consider what the implications of this might be. This is another auspicious, unique development that this book doesn't follow up with, and I hope the next volume is truer to form -- more suspense, more consequences, and with more of the regular creative team back on board. Sorry for the off-topic, but I just saw this and I don't know if this has already been mentioned elsewhere! In the description of PRODIGAL TPB (the new edition under the label KNIGHTFALL 25th ANNIVERSARY) they mention TROIKA!! I did not find any information about it, but it seems TROIKA will be collected! Do you think it will collect more issues after TROIKA? Maybe Chuck Dixon and Graham Nolan's run, since Moench and Jones are already collected in their own HCs? 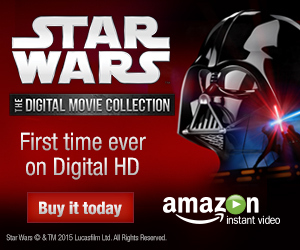 A TPB with only TROIKA seems too thin for the kind of big TPBs they are doing with this collection. What do you think? Based on how the third Knightfall Omnibus is ordered, one would suspect Troika would contain the four part arc plus Nightwing: Alfred's Return and Vengeance of Bane II. That makes sense, following the Omnibus. That would be nice, too, though I would love to see a Chuck Dixon/Graham Nolan TPB collections come true... specially their run after Troika and before Cataclysm (the black suit era) is specially entertaining and fun! Good to know Troika is getting its own collection, too. I suppose it's only coming out in February, which would explain why it wasn't listed in DC's Fall 2018 catalog. I sort of envy people who will buy these new Knightfall TPBs instead of the omnibi. Not only they'll probably get LotDK #61 with its first four pages in proper order, but they'll also get to slot the Batman: Zero Hour TPB between Knightsend and Prodigal. Do we know if the Knightquest: the Crusade trades have more content than the old Knightquest trade that came out a few years ago? Knightquest Vol. 1 will include Robin #2 (just to resolve the cliffhanger at the end of #1) and Vol. 2 will include a story from Showcase '94 #7. Other than these two issues, they'll have the same contents as the thick Knightquest trade from 2012, minus Robin #7, which will be collected at the end of the Knightquest: The Search TPB.